Lawrence High's Evann Seratte takes the baton from Asjah Harris in the 4x400-meter relay at the state track and field meet on Saturday, May 26, 2018, at Wichita State's Cessna Stadium. WICHITA — A strong cast of juniors on the Lawrence High girls track and field team arrived at LHS right after the Lions won a Class 6A state title, so they had heard plenty of stories about what it was like to finish atop the standings on the biggest stage. After two years of learning what it takes to be successful at the highest level, the Lions got to experience what it was like to win a state title for themselves on Saturday at Wichita State’s Cessna Stadium. 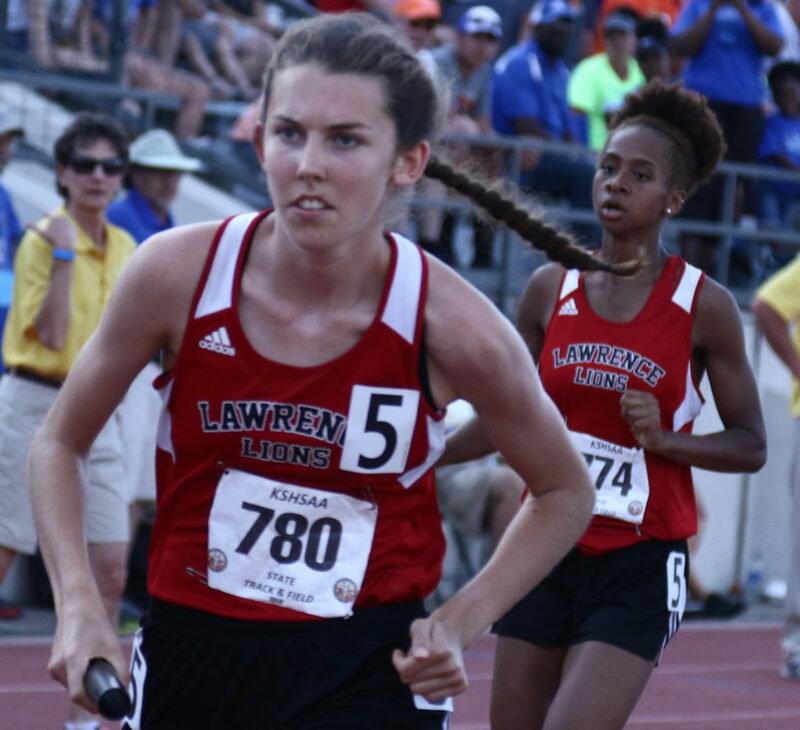 Lawrence High rolled to the Class 6A team title by scoring 82 points. Olathe Northwest was a distant second with 61. 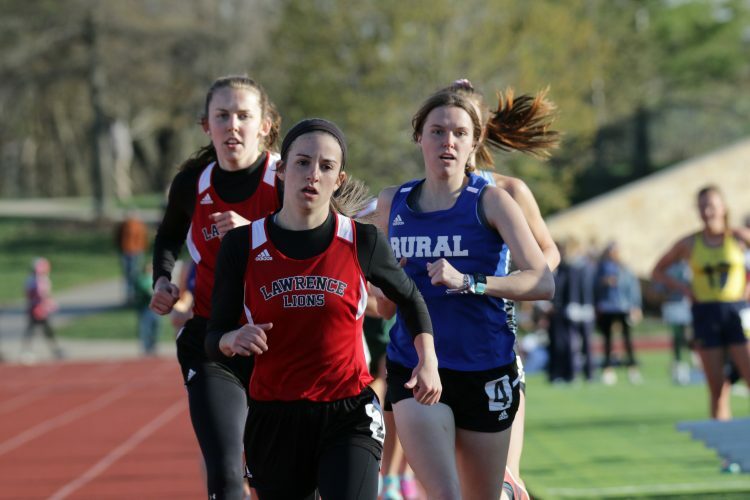 Two of those juniors were able to attest to that after Evann Seratte and Hannah Stewart finished first and third, respectively, in the 800 meters. After not qualifying for state in the 800 as a sophomore, Seratte broke the school record on Saturday with a time of 2:16.09. Seratte added a second-place finish in the 400 meters. While the LHS junior wasn’t able to chase down Wichita Southeast’s Christal Mosely, she grinned as she crossed the finish line knowing that she still scored eight pivotal points when the team standings were tight. While Seratte and Stewart stepped up their performances this spring to set a tone for the Lions on the track, there were plenty of talented underclassmen following suit. The Lions’ 4×100-meter relay team of Ashley Wildeman, Amaya Harris, Bella Kirkwood and Asjah Harris won a state title with a school-record time of 47.90. Asjah Harris joined Ozi Ajekwu, Stewart and Seratte on the Lions’ second-place 4×400-meter relay team, and was the runner-up in the 200 meters. The Lions racked up the points in the field events as well on Saturday. The junior combo of Chisom Ajekwu and Krissy Howard placed third and fifth, respectively, in the shot put with throws of 38 feet, 7.75 inches and 37 feet, 10 inches. Even with Baylee Unruh and Amaya Harris medaling in the javelin on Friday, Ajekwu and the LHS throwers have been motivated to hold their own with how well the Lions have performed on the track. Ella Stewart also chipped in a 13th-place finish in the discus. Jayden Wilson, Stewart, Layne Prescott and Seratte ensured that the Lions would get to the podium in all three relays after finishing sixth in the 4×800. 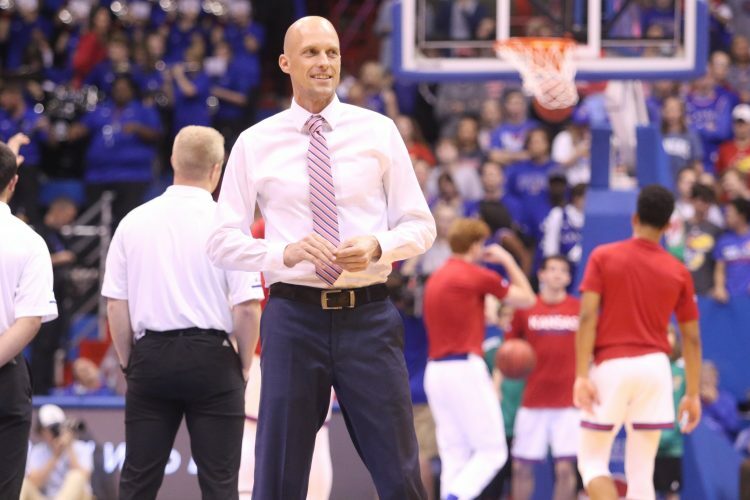 Along with being proud of the Lions for winning the 108th state title in school history, Hood was just as pleased with how they rose to the occasion after challenging themselves. Hood remembered having a conversation with Josie Hickerson, Stewart and Seratte when they were freshman at the state meet, and believes that they learned a lot from watching the LHS boys fall just short of a state title. The Lions finished 20th in the boys team standings with 15 points. Dre’Shun Bridges was the lone competitor for the LHS boys on Saturday, and finished 12th in the 100 meters. Going into her final attempt in the girls long jump, Free State senior Cameryn Thomas expected more out of herself. Thomas’ goal was to get a top-three finish in the long jump, and after giving herself a pep talk, she did just that. The Kansas signee saved her best attempt for last with a jump of 18 feet to get third. Thomas finished sixth in the long jump at the state meet as a junior. With adding the hurdles to her list of events this season, Thomas had to put in some extra work to get even stronger in the long jump. 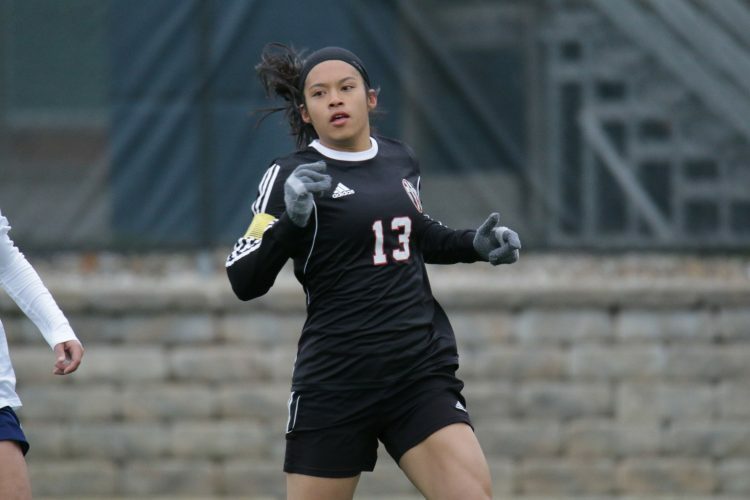 She felt that her showing on Saturday proved that her hard work paid off. The long jump was one of three events that Thomas placed in on Saturday. The Free State senior finished fifth in the 300 hurdles (47.55) and eighth in the 100 hurdles (16.13). Also making her way up to the podium for the Firebirds was Emma Hertig after clocking in at 2:21.93 in the 800 meters to place sixth. Hertig teamed up with Erin Fagan, Anna Riley and Julia Larkin to place 10th in the 4×800-meter relay. 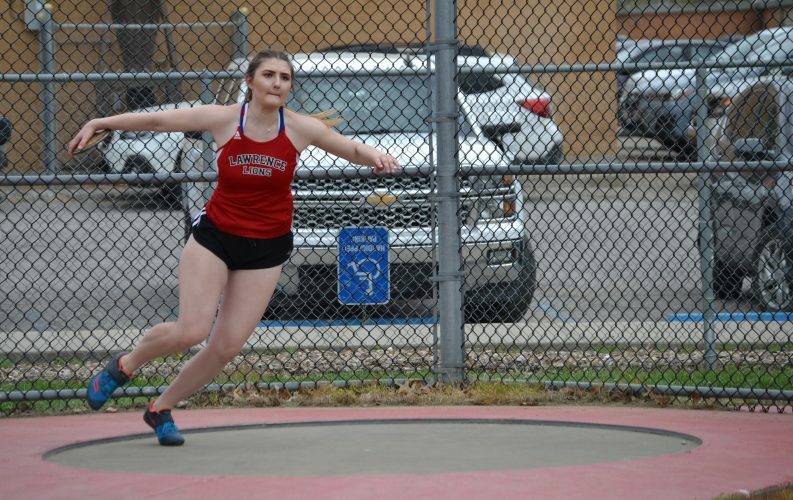 Liliana King-Wilson (ninth in the high jump) and Kala Ewing (10th in the discus) were also in action for the Firebirds on Saturday. The Free State girls placed 14th as a team. The Free State boys didn’t have anyone competing on Saturday, and placed 23rd in the 6A boys standings. The 2018 track and field season didn’t go as smoothly as Tonganoxie’s LeeRoi Johnson had hoped, but the bumps in the road that he encountered only made him stronger. Johnson was hampered with injuries from football season and went through some rigorous rehab this spring, but repeating as a state champion in the 4A boys discus with a throw of 192 feet, 11 inches made it worth it. Johnson helped the Tongie boys tie for 16th. On the girls side, the Chieftains medaled in three different events. Corrin Searcy took third in the 400 meters, and joined Natalee Shepard, Sierra Staatz and Trinity Touchton on the Chieftains’ eighth-place 4×100-meter relay team. Shepard added a seventh-place finish in the 200. The THS girls tied for 22nd. Kayla Kurtz (javelin) and Natalie Beiter (800 meters) both finished as the runner-up in their respective events to lead the Baldwin girls team to a tie for fifth place. Heiter also earned two medals as a member of relay teams. Abby Ogle, Natalie Beiter, Ambrynn Stewart and Carly Lindenmeyer finished fourth in the 4×400-meter relay. Beiter was joined by Ambrynn Stewart, Alexia Nelson and Tennyson Wilson on the Bulldogs’ third-place 4×800-meter relay team. Abby Ogle (seventh in the 300 hurdles), Sydney Bergan (10th in the pole vault) and Kate Ogle (12th in the javelin) rounded out the competitors for the Baldwin girls on Saturday. The Baldwin boys tied for 34th with the help of seventh-place finishes from Matthew Jackson in the 200 and the 4×800-meter relay team of Jacob Bailley, Riley Russell, Jayce Dighans and Parker Wilson. Johnson finished 12th in the 800 and 1600. Jackson took 13th in the 200 and Bailey finished 15th in the 1600 to represent Baldwin on Day 2. Shane Quinlan was the runner-up in the 200 and 400, and helped Perry-Lecompton to second place in the 4×400 to highlight Day 2 of the state meet for the Kaws. Dalton Kellum, Ty Packard and Colton Mallonee joined Quinlan on the 4×400 team. Packard (seventh), James Bartlett (eighth) and Jessye Schumann (16th) also were in the 3A boys 800 field for the Kaws. Calvin McPherson teamed up with them to guide the Kaws to 13th in the 4×800 relay. Mallonee led the Kaws in the field events with a fourth-place finish in the triple jump. The Kaws finished sixth in the 3A boys team standings. The Perry-Lecompton girls tied for 34th. Talisa Stone medaled for the Kaws with a third-place finish in the high jump. Haley Kellum (11th in the triple jump) and Cali Coleman (14th in the 100) rounded out the competitors for the P-L girls. Jon Bock finished fifth in the high jump to lead Eudora on Day 2. Both of the Cardinals 4×800 relay teams placed 11th. The relays were comprised of Bobby Lounsbury, Jacob Boucher, Zan Martin and Noah Katzenmeier for the boys and Emma Campbell, Reagan Hiebert, Melia Martin and Riley Hiebert for the girls. Mia Manley (12th in the girls pole vault), Katzenmeier (15th in the boys 800) and Keagan Shockley (16th in the boys 100) were all in action for Eudora on Saturday. The EHS boys tied for 38th. The Ottawa boys tied for 14th thanks to a second-place finish from the 4×400 team of Triston Saavedra, Brandon Carlson, Travis Lutz and Kasey Spigle. Spigle and Saavedra placed second and 11th, respectively, in the 800, while Lutz took third in the 1600. 6A girls team scores — 1. Lawrence High, 82; 2. Olathe Northwest, 61; 3. Shawnee Mission East, 55.5; T-4. Olathe North, 50; T-4. Shawnee Mission East, 50; 6. Junction City, 41.5; T-7. Wichita Southeast, 40; T-7. Blue Valley North, 40; 9. Gardner Edgerton 38; 10. Shawnee Mission Northwest, 37; 11. Garden City, 30.5; 12. Olathe South, 27; 13. Shawnee Mission West, 23; 14. Free State, 22; T-15. Olathe East, 16; T-15. Manhattan, 16; T-17. Blue Valley Northwest, 15; T-17. Wichita East, 15; 19. Shawnee Mission North, 13; 20. Washburn Rural, 8; T-21. Dodge City, 5; T-21. Wichita South, 5; 23. Derby, 3; 24. Blue Valley, 2.5; 25. Blue Valley West, 2; T-26. Topeka High, 1; T-26. Haysville-Campus, 1. 6A boys team scores — 1. Manhattan, 76; 2. Shawnee Mission Northwest, 66; 3. 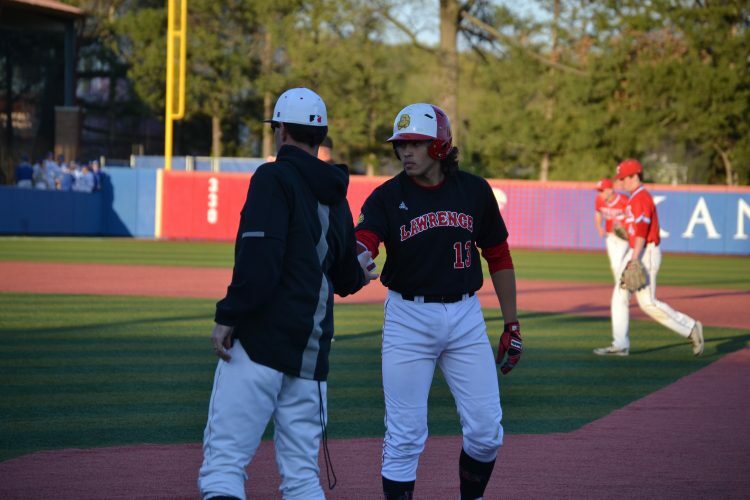 Haysville-Campus, 41; 4. Wichita South, 37; T-5. Washburn Rural, 35; T-5. Garden City, 35; 7. Junction City, 34; 8. Hutchinson, 33; T-9. Gardner Edgerton, 29; T-9. Olathe South, 29; 11. Olathe Northwest, 27; 12. Wichita Southeast, 25; T-13. Olathe East, 23; T-13. Shawnee Mission North, 23; T-15. Shawnee Mission West, 20; T-15. Blue Valley West, 20; T-15. Olathe North, 20; T-18. Blue Valley North, 17; T-18. Wichita Northwest, 17; 20. Lawrence, 15; 21. Shawnee Mission South, 14; 22. Blue Valley, 13; 23. Free State, 12; 23. Wichita East, 12; 25. Wichita West, 9; 26. Topeka High, 6; 27. Derby, 5; 28. Wichita North, 4; 29. Shawnee Mission East, 2; T-30. Blue Valley Northwest, 1; T-30. Dodge City, 1. 4A girls team scores — 1. Andale, 90; 2. Paola, 74; 3. McPherson, 44; 4. Jefferson West, 43; T-5. Baldwin, 34; T-5. Lindsborg-Smoky Valley, 34; 7. Chapman, 30; 8. Augusta, 29.5; 9. Spring Hill, 26; 10. Concordia, 25; T-11. Andover-Central, 20; T-11. Burlington, 20; 13. Abilene, 19; T-14. Iola, 16; T-14. Santa Fe Trail, 16; 16. Louisburg, 15; T-17. Ark City, 14; T-17. Wellington, 14; 19. Clearwater, 13; 20. Bishop Miege, 12; 21. Pratt, 10; T-22. Tonganoxie, 9; T-22. Marysville, 9; T-22. Piper, 9; T-22. Fort Scott, 9; 26. Wichita Trinity, 8; 27. Mulvane, 7; 28. Towanda-Circle 6; T-29. Frontenac, 5; T-29. Parsons, 5; T-29. St. George-Rock Creek, 5; T-32 Hayden, 4; T-32. Nickerson, 4; T-32. Buhler, 4; T-32. Girard, 4; 36. Independence, 3; T-37. Winfield, 2; T-37. Coffeyville-Field Kindley, 2; T-37. Clay Center Community, 2; 41. Wamego, 1.5; T-42. Atchison, 1; T-42. Anderson County, 1; T-42. Bonner Springs, 1. 4A boys team scores — 1. Buhler, 53; 2. Piper, 40; 3. Andale, 34.5; T-4. Holcomb, 34; T-4. Hugoton, 34; T-6. Lindsborg-Smoky Valley, 33; T-6. Bishop Miege, 33; 8. Clay Center Community, 30.5; 9. Parsons, 26; T-10. McPherson, 24; T-10. El Dorado, 24; T-10. Paola, 24; 13. Ark City, 23; T-14. Mulvane, 22; T-14. Ottawa, 22; T-16. Holton, 21; T-16. Tonganoxie, 21; T-18. Towanda-Circle, 20; T-18. Wichita Collegiate, 20; 20. 15; T-21. Marysville, 12; T-21. Galena, 12; T-23. Chapman, 11; T-23. Chanute, 11; T-23. Winfield, 11; 26. Labette County, 10.5; T-27. Nickerson, 10; T-27. Sumner, 10; 29. Wamego, 8; T-30. Pratt, 6; T-30. Frontenac, 6; T-32. Hays, 5; T-32. Bonner Springs, 5; T-34. Abilene, 4; T-34. Rose Hill, 4; T-34. Louisburg, 4; T-34. Baldwin, 4; T-38. Eudora, 3.5; T-39. Ulysses, 3; T-39. Andover-Central, 3; 41. Clearwater, 2; T-42. Girard, 1; T-42. Baxter Springs, 1; T-42. Santa Fe Trail, 1. 4×100 relay — 1. Ashley Wildeman, Amaya Harris, Bella Kirkwood, Asjah Harris, 47.90. 4×400 relay — 2. Ozi Ajekwu, Hannah Stewart, Asjah Harris, Evann Seratte, 4:01.35. 4×800 relay — 6. Jayden Wilson, Hannah Stewart, Layne Prescott, Evann Seratte, 9:52.46. 200 — 2. Asjah Harris, 25.10. 400 — 2. Evann Seratte, 58.39. 800 — 1. Evan Seratte, 2:16.09; 3. Hannah Stewart, 2:19.78. Discus — 13. Ella Stewart, 103-05. Shot put — 3. Chisom Ajekwu, 38-07.75; 5. Krissy Howard, 37-10. 100 — 12. Dre’Shun Bridges, 11.18. 4×800 relay — 10. Emma Hertig, Erin Fagan, Anna Riley, Julia Larkin, 10:08.46. 100 hurdles — 8. Cameryn Thomas, 16.13. 300 hurdles — 5. Cameryn Thomas, 47.55. 800 — 6. Emma Hertig, 2:21.93. Discus — 10. Kala Ewing, 108-08. High jump — 9. Liliana King-Wilson, 5-00. Long jump — 3. Cameryn Thomas, 18-00. 4×400 relay — 4. Abby Ogle, Natalie Beiter, Ambrynn Stewart, Carly Lindenmeyer, 4:09.96. 4×800 relay — 3. Ambrynn Stewart, Alexia Nelson, Tennyson Wilson, Natalie Beiter, 9:53.61. 300 hurdles — 7. Abby Ogle, 48.49. 800 — 2. Natalie Beiter, 2:18.84. Javelin — 2. Kayla Kurtz, 142-11; 12. Kate Ogle, 113-07. Pole vault — 10. Sydney Bergan, 9-06. 4×800 relay — 7. Jacob Bailey, Riley Russell, Jayce Dighans, Parker Wilson, 8:28.31. 100 prelims — 13. Matthew Jackson, 11.34. 200 — 7. Matthew Jackson, 23.13. 800 — 12. Parker Johnson, 2:03.79. 1600 — 12. Parker Wilson, 4:45.82; 15. Jacob Bailey, 5:12.15. 100 prelims — 14. Cali Coleman, 13.33. High jump — 3. Talisa Stone, 5-02. Triple jump — 11. Haley Kellum, 32-06.25. 4×400 relay — 2. Dalton Kellum, Ty Packard, Colton Mallonee, Shane Quinlan, 3:27.41. 4×800 relay — 13. Ty Packard, Calvin McPherson, Jessye Schumann, James Bartlett, 8:43.55. 100 prelims — 13. Dalton Kellum, 11.64. 200 — 2. Shane Quinlan, 22.86. 400 — 2. Shane Quinlan, 50.51. 800 — 7. Ty Packard, 2:03.25; 9. James Bartlett, 2:04.80; 16. Jessye Schumann, 2:21.90. 4×100 relay — 8. Natalee Shepard, Corrin Searcy, Sierra Staatz, Trinity Touchton, 50.83. 200 — 7. Natalee Shepard, 26.89. 400 — 3. Corrin Searcy, 58.98. Discus throw — 1. LeeRoi Johnson, 192-11; 16. Kyle Snyder, 192-11. 4×800 relay — 11. Emma Campbell, Reagan Hiebert, Melia Martin, Riley Hiebert, 10:30.99. 100 prelims — 16. Keagan Shockley, 13.25. Pole vault — 12. Mia Manley, 8-06. 4×800 relay — 11. Bobby Lounsbury, Jacob Boucher, Zan Martin, Noah Katzenmeier, 8:40.40. 800 — 15. Noah Katzenmeier, 2:06.38. High jump — 5. Jon Bock, 6-02. 4×400 relay — 2. Triston Saavedra, Brandon Carlson, Travis Lutz, Kasey Spigle, 3:24.99. 800 — 2. Kasey Spigle, 1:57.58; 11. Triston Saavedra, 2:02.86. 1600 — 3. Travis Lutz, 4:29.50.